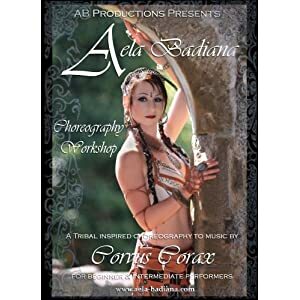 This DVD is by Aela Badiana, a German belly dancer based in the US. I hadn't heard of her before, but apparently she teaches cabaret, ITS and Tribal fusion. This is a nice choreography for a fast, upbeat Tribal fusion number. It's broken down well into 5 combinations and clearly taught in a studio environment, with mirrors so you can see front and back views. The final performance is filmed at a castle. I am not a great fan of filming dances outdoors in non-theatrical settings, but it works in this case.